Be present. Be prepared. Be clear. Since publishing a memoir about my dad’s end of life, I received an outpouring of support from others who experienced the loss of loved ones in their own lives. Many sent heart-felt comments and poignantly precious memories. Some sent books they wrote as part of their own journey with grief. I am deeply touched and honored to receive the offerings of each new connection. Some weeks, I’ve received so many such word-gifts that I feel like the “Keeper of the Stories.” This distinction draws me to a new purpose: compiling perspectives that inform others who support the dying, grieving or bereaved. That work calls me into action each day and will soon be brought to fruition in another book. Meanwhile, here and now, I’d like to share three themes extracted from these heart-led stories about the choices we make and the peace we seek as we prepare for the end of life (and for the fullness of all our days). 1. There is no time like the present. I mean this statement in every way you can learn from it. Now is the best time to get ready for what will come later, whether you are ill or perfectly well, young, middle-aged or of a ripe old age. Living in a state of readiness brings peace of mind. • Are you ready for anything? • Handling your most important stuff? • Living your greatest dreams and purposes? • Leaving a loving legacy for others? Another meaning is that of being present. There is no time, truly, other than this “now” moment. The past is gone, the future unlivable and unforeseeable. Let go of past and future thoughts in order to truly experience each present moment and know the peace that being present brings. Be present for yourself. Be present for others. The present is a gift to live and treasure. 2. Be prepared to be at peace. Preparation and peace mean different things to different people. What does that statement mean to you? For some, it means putting your physical house in order, perhaps marking or listing each item of importance with the name of its intended recipient, a very tidy gift to leave your family. You may choose to carefully distribute your finances as the gifts you have in mind for each person and each purposeful cause you hold dear. Perhaps you will leave a legacy letter to convey an inheritance of intentions, ideas and ideals. You may wish to “go within” to prepare, accepting that life comes to an end, inevitably, and being ready in every possible way to meet that day with a joyful spirit and a grateful heart. 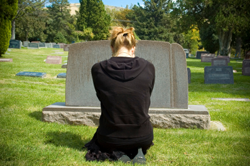 It may mean taking a leading role as a spiritual anchor for other grieving hearts. Sometimes the dying one is most capable of this gift of spirit; other times another is most adept and at peace with the prospect of dying and death. Perhaps you or others do not embrace a spiritual aspect of death at all. Are you prepared to accept that? Letting go of expectations may bring greater peace. You may want to “right the wrongs” in your life, to say what has never been said, or to leave it in writing if the words come too hard to your lips. You may want to invite family members and friends to speak their own truths, to ask their respective questions and to find greater peace in that process. Feeling “complete” is a way of getting prepared to be at peace. 3. Be clear about the kind of death and dying experience you prefer. Being unprepared and undocumented will lead to medical interventions and life-prolonging procedures you may not want. • Are you ready to think about dying and speak of it with your loved ones? • Do you have succinct and explicit living wills and advance directives in place? If so, make sure all who may be involved at the end of your life — family members, spiritual advisors and health care professionals — clearly understand your wishes. Give them copies of your signed documents and update them as your preferences change. New options and specific choices may align better with your personally evolving journey. • Ask for what you need and want. • Ask what others need and want. Death and dying are part of life; by definition, they are the final chapter. You play an important role in your life story’s end, and you may choose that role with care. These are just a few of the ways that people I know enhanced their personal peace with forethought and planning in end-of-life decision-making. Be present. Be prepared. Be clear. I am thankful for the ideas others share with me. I hope you’ll also share them and find them of benefit. A writer, editor and author coach, I am inspired by the journey of love and release through my father’s end of life. In 2013 I published a book about our experience. Guided by my father's living example as an author and activist, I write to contribute to how we prepare, individually and collectively, to live and support the final chapter of life. I write to immerse in the moment and to experience the satisfaction that writing can bring. Oklahoma is the home of my roots. I lived in McCloud, Tahlequah, Oklahoma City and Tulsa for many years before a recent move to Toronto, Ontario. As a young adult, I meandered through a variety of career emphases in environmental and biomedical sciences before realizing I was called to be an educator. Following my heart into education of gifted children, I enjoyed nearly twenty years, first as a Whole Language, Spanish and art teacher and then as an administrator. With a growing love of children, I courageously became a parent, twice! The joy and purpose I feel in that role is a guiding light in my daily life. Now my two daughters are firmly on the paths of their own journeys through life; I thrill to watch them as they navigate their chosen courses. In 2006, I grew wings that took me all the way to Toronto, where I joined my life partner and soul mate. There, I reinvented my career to flexibly accommodate travel between the home of my family of origin in Oklahoma and my new home in Canada. I established my own business as a writer, editor, author coach and self-publisher. It has been my great pleasure to work with other writers as a partner in authorship, or as editor and coach, and I look forward to many more such affiliations. With each passing day, more topics and opportunities present themselves and I embrace them with gratitude. During the months, weeks and days leading up to my father's death, I was present as much as possible. I was with him when he transitioned from this earthly life in April of 2012, so very privileged to be at his side. Later, as my sorrow washed over me in waves, I began to write our very personal story, and I connected with his memory, integrating my grief, through that effort. In 2013, I published the story as a short book and included resources to support others facing end-of-life issues. Since the book's publication as "Daddy, this is it. Being-with My Dying Dad," I have reached out to many grief and bereavement support workers, hospice and palliative care chaplains and end-of-life advocates with an introduction to my book. I make many valued connections as I reach out with this purpose. With one such connection, Victoria Brewster, MSW, I am now co-writing another book on Death, Dying and the End of Life. We hope this book will offer a unique and comprehensive perspective, with multiple contributors sharing their end-of-life experiences. Thank you for your encouraging words, Marty! You are a mentor to so many who write on this subject. I thank you for your presence in our cultural conversation around grief, loss and the prospect of a chosen path at the end of life. The book is taking shape, thanks to many and varied storytellers/contributors.